Scene at Wednesday Shot Clinic. 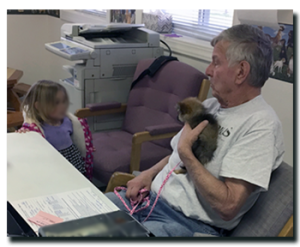 BHS Volunteer holding puppy and interacting with visiting child. Volunteers are always welcome to join us. Please contact us if you would like to help out! To become a member of the Bannock Humane Society, fill out the form and return it. Can you help out? We’d love for you to get involved!! We can’t succeed without you. To print a membership application please Click Here.